Dr. Nicolae RoddyDr. 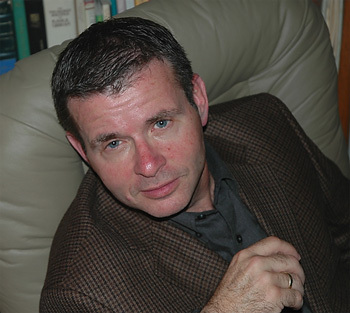 Nicolae Roddy is an Associate Professor of Old Testament at Creighton University in Omaha, Nebraska, and an archaeologist in the Holy Land. Carole Buleza began the interview wondering if participants would find the Old Testament to be a dry subject . . .
1. The Old Testament is viewed by some as overwhelming, and by others as "dry." For those who might be wondering whether to take your class, could you address this? Gladly, Carole! First off, it seems to me that both groups appear to suffer from the same malady of passing judgment on something they either have not taken the time to really get to know, or perhaps they simply lacked the firm but gentle hand of a capable teacher. When St. Paul urged his congregations to study the Scriptures, he was not referring to the New Testament, since it did not exist at that time. While the Orthodox position holds that proper understanding of the Older Testament derives from the lens of the New Testament, it equally affirms that the New Testament would be unintelligible without the prophetical context of the Older Testament. What I would propose is this: to challenge both groups to sign up for the class. In return I will guarantee that not only will the Older Testament come alive for them as never before, but they will think twice about the casual passing of judgment on anything again [wink and a smile]. Actually, this has very little to do with me, but has everything to do with the fundamental message of the Older Testament, which for now will remain undisclosed. 2. 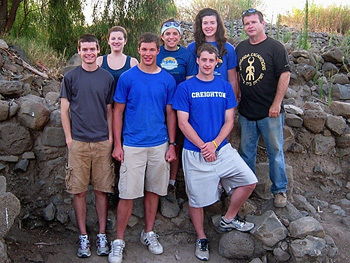 You are involved in two on-going projects in the Holy Land. Can you explain each of them? Certainly! Both of these projects have to do with archaeology. The first is the Bethsaida Excavations Project, which I have co-directed and supervised nearly every season for the past 15 years. Bethsaida is the third most important city in the New Testament, after Jerusalem and Capernaum. It served as Jesus Christ’s base of operations and was the place where the first-called disciples had made their living as fishermen. Located near the north shore of the Sea of Galilee, it was lost for much of the last two millennia, but when it was re-discovered in 1987, it was found to sit atop a massive Iron Age city from roughly the time of King David (10th C BC). The other archaeological enterprise I co-direct is the Virtual World Project, which is an on-line, fully interactive virtual reality resource available at www.virtualworldproject.org. Its purpose is to bring nearly all the major archaeological sites throughout the Holy Land into the home or classroom. I invite your readers to contact me for further information about either of these projects, including the prospect of volunteering. 3. What was the most exciting discovery of your excavations? On July 11, 1997, at around 9:30 a.m., one of my student volunteers came running up to say he had uncovered something unusual. Whatever it was must have really frightened him, because his hands were still trembling and his face was pale. He looked as though he had awakened a sleeping god. When I turned up the face of the basalt stone he had found, I found that this was nearly the case, for on it was carved the head of a bull, with the moon cradled in its horns. We found the rest of the pieces, which turned out to be a stela dedicated to a Mesopotamian moon god, which once stood just outside the city gate. It was destroyed by the Assyrian leader, Tiglath Pileser III, in 722 BC. There it lay in pieces for over 2700 years, covered over by the dust of ages. It has since been restored and may now be viewed in the Israeli Museum in Jerusalem. 4. Your native Romania has a rich Christian, and particularly monastic, history. Have you done any archaeological work there? In a word, no; but I do entertain the hope of one day digging there. I spend quite a lot of time in Romania, not only because of having relatives there, but also professionally as a faculty associate for the Jewish Studies Center at the University of Bucharest. My wife, Alexandra, who partners with me in my archaeological projects, is from Bucharest and she has participated in Roman-period excavations in Romania. 5. At the bottom of your website is the phrase, "A unified theory of the Universe need not reconcile the cosmos with quantum mechanics, only Love with the Soul." Obviously, you have a deep spirituality. How has your study of the Old Testament enriched your relationship with God? That’s an excellent question, for which I thank you. You see, the deeper I have gone into the prophetic Word of God echoing throughout the Older Testament and barreling down the corridor of human history, the more I have become aware of the flipside of what it means to be created in the image of God—namely, that I am not god. Since that existential encounter with those uncompromising prophets of the Older Testament, I have not been able to shirk any of my responsibilities, whether as husband, father, teacher, scholar, brother, friend, citizen, etc. Those who thump the Bible in peoples’ faces, thinking it supports them in untested positions they already hold, have not truly understood the Bible; for if they did, they would see that reading the Word is like holding a snake in that it soon turns around to bite the person who holds it. I’ll explain this further when we meet in November. I hope we’ll have a tremendous crowd to participate in all these exciting topics.